No Q or W trains were running between the 57th Street-7th Avenue station and the 96th Street station in both directions after an outage on Friday, MTA officials said. MANHATTAN — A power outage caused a shutdown on the Second Avenue Subway line for nearly three hours Friday, causing delays and service changes on the Q and W trains, MTA officials said. Power in the Second Avenue Subway's third rail went out just before 10:30 a.m. between the 72nd and 86th street stations, according to MTA spokesman Kevin Ortiz. Workers were able to briefly restore power but lost it again just before 11 a.m., he said. 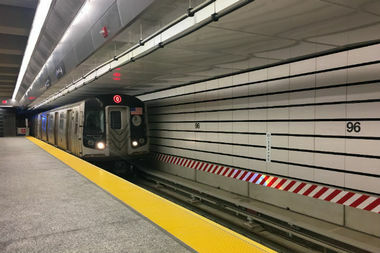 Second Avenue Q train service resumed again around 1:15 p.m., according to the MTA, though the agency warned riders to expect "extensive delays" on the B, N, Q, R and W trains. W trains were still not running between 57th Street-7th Avenue and Ditmars Boulevard in Astoria, and riders were advised to take the N train instead. Earlier this month, three escalators at the Second Avenue Subway's 83rd Street entrance were damaged after faulty sensors set water sprinklers off. The entrance was shut down for roughly eight days, according to officials.